Pit stop at Prospect Park, Stanley Park. One more half lap before we break. 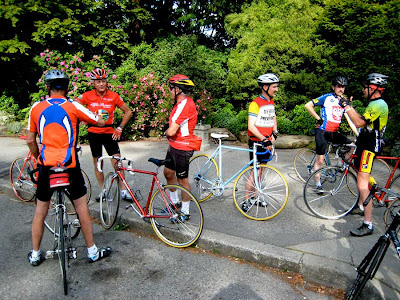 It's fun to get back in touch with the Wednesday afternoon ride at Stanley Park, Vancouver. I haven't been back riding here since the early 90's. 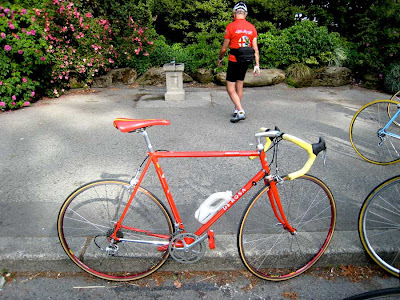 Fritz rode his beautiful De Rosa SLX. And he is eagerly working on his recently bought 'Proctor' from Edmonton. He's looking to equip it with Mavic. Steve had his Masi and Brian had his very nice 'Davidson' from Seattle. Han's is still waiting for his Master X-Light and word has it that a steel fork is available. We all wait with bated breath. Ulli is off for a cross province bike ride to Banff in August. He mention going through the Coquihalla highway and over the Kicking Horse Pass. And he won't be alone. It's going to be a one way adventure as he's taking the bus back. I wish him a great ride! Fritz on his way for water. But his beautiful De Rosa remains. The red rims adds to this looker. How about the Campagnolo aero waterbottle! Check it out. You'll love it. It's a piece of art. There's nothing like a beautiful steel bike!